BRUSSELS, Belgium, September 22, 2010 (ENS) – Shoppers in Europe are finding more green products on the shelves as European retailers take action on their promises to promote environmentally sustainable consumption patterns. A monitoring report out today shows members of the European Retail Forum are hitting many of the voluntary targets they set last year. Since the Retail Forum was launched in March 2009 as a joint initiative of the European Commission and the retail sector, retailers have focused on improving energy efficiency and increasing sales of greener products. Retailers also set goals for reducing packaging and waste, conserving water, optimizing low carbon emission transport, and reducing energy consumption of stores by improved lighting and freezing. Retailers made 285 environmental commitments in three categories – What we sell, How we sell, and Communication – and established a database to organize them. As well as putting more sustainable products on supermarket shelves, retailers have also made progress in reducing their environmental footprint, paying particular attention to resource efficiency measures. Potocnik praised retailers for their efforts to become more resource efficient and reduce their environmental impact, but he said much more remains to be done. Communicating with consumers on sustainability issues also needs improvement, and the report recommends setting up an award scheme to reward best practices. Monitoring of the first series of commitments for 2009 has revealed many examples of good practice, the report finds. Visits made to stores in member states across the EU showed that retailers are offering more ecolabeled and organic products. The supermarket chain Carrefour has increased the number of its own brand organic products by 83 percent compared to 2006. “As the world’s second largest retailer, the Carrefour Group is committed to democratize and promote sustainable consumption. The Group is thus developing own brand and banner brand products affordable to every budget and which integrate environmental criteria,” the company says in a statement on its website. 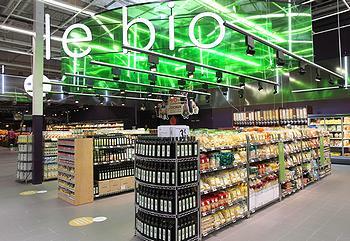 Mercadona, the largest supermarket operator in Spain, has achieved a 100 percent recovery rate for packaging waste in stores and distribution centers, investigators found. Asda Wal-Mart reduced carbon dioxide emissions from fleet transport by 40 percent of 2005 levels and Lidl achieved a reduction of 10,000 tonnes of CO2 in 2009 by using shopping bags made from recycled materials. The retailers achieved several of their targets for 2009, the report shows. They stopped selling incandescent light bulbs equal to and above 75 watts. They achieved a 100 percent share of private brand sustainable/recycled household and sanitary paper products. They increased the amount of polyester fleeces made from recycled plastic. But some targets either were not met or could not be assessed. Data for range of own brand certified products in Europe were provided only for 2008. A target was set to expand range of Marine Stewardship Council labelled fish and to sell no bluefin tuna, which is at risk of extinction due to unsustainable harvesting. But no data were provided by the retailers for the MSC products or bluefin tuna in Europe. In June, the retailers presented a voluntary environmental code of conduct for the sector. The Retail Environmental Sustainability Code focuses on the sustainable sourcing of specific products such as timber or fish, increased resource efficiency in stores, optimisation of transport and distribution, better waste management practices and improved communication to consumers. Signatories agree to report on their progress, for instance through their annual corporate sustainability report. Nineteen major retailers and seven retail associations have signed on to the code of conduct. The Retail Forum was launched in 2009 with the aim of generating a better understanding of the practical measures needed to promote sustainable consumption. Membership is open to all retailers who join the Retailers’ Environmental Action Programme and to civil society organizations wishing to contribute to its objectives.